Mobilize members for a stronger contract with higher salaries and immediate payment of retro. End the per session pay formula and restore real time and a half for work beyond the school day based on salary. Establish paid maternity and paternity leave on par with international standards. 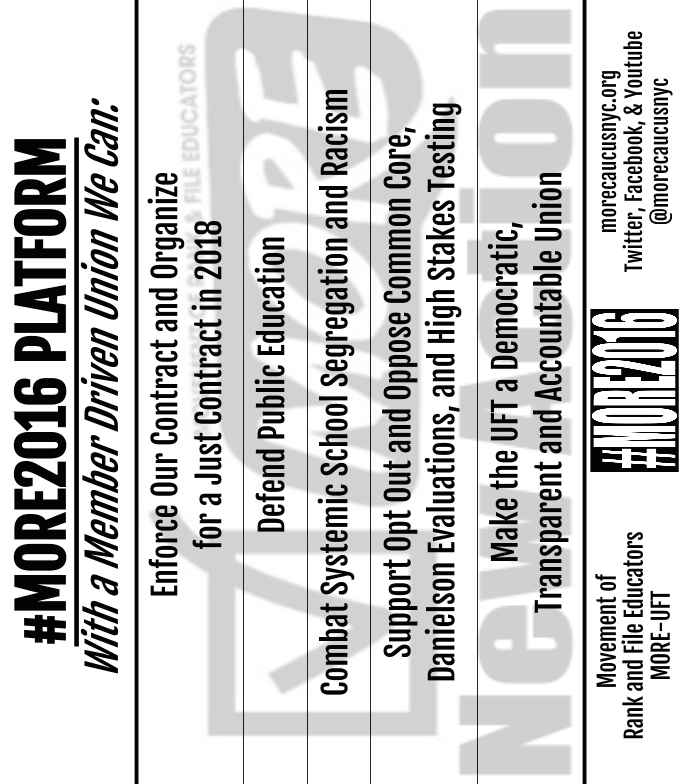 Win due process rights for untenured educators and launch a campaign for due process for all New York City workers. Strengthen whistleblower protections for all educators and make the tenure process shorter, clearer, and fair. Revise the ‘Fair Student Funding’ Formula. The DOE must return to the system in which each school’s budget was charged the same fixed amount per teacher. The current system incentivizes principals to hire inexperienced teachers. We must restore the right of an educator to transfer on the basis of seniority or to further integration. More teacher voice in shaping professional development and equal access to PD opportunities. Take on abusive administrators and allow teacher evaluation of administrators. Expand contract Article 8E so that not only the format of a lesson plan, but the teaching of the lesson is up to the professional discretion of each teacher. Strengthen the grievance procedure by removing the cap that has been placed on the number of arbitration cases permitted annually; providing a UFT investigative team for each case; and restoring rights that have been bargained away such as the right to grieve any material in our file. Eliminate the designation “ATR” and assign teachers to a school of their choice in their District. Until the ATR designation is abolished, the UFT shall have an ATR chapter with elected representatives. Organize with parents to ensure New York City enforces the Contracts for Excellence (C4E) law, passed in 2007, which required NYC’s Department of Education (DOE) to achieve the following numbers: no more than 20 students in K-3 classes, 23 in grades 4-8, 25 in HS. Oppose co-locations, convert charter schools into public schools covered by the contract and end involvement in UFT Charter Schools except as a representative of union members. Fight to end closures and receivership. Hold principals accountable to parents, teachers and students with regular audits and contractually-empowered SLTs. Fully staff schools and provide wrap around services, including more teachers, paraprofessionals, guidance counselors, social workers, psychologists, and school counselors with reduced caseloads. Combat Systemic School Segregation and Racism. Work with the DOE to recruit and retain a teacher workforce that matches the diversity of New York City. Initiate and promote programs to integrate schools and provide equitable allocation of resources such as arts, music, after-school programs, sports, food programs, etc. Win funding for restorative justice coordinators and racial equity teams in every school. These coordinators and teams should work with safety committees and school leadership teams to come up with school-based safety programs that fit each school. Work for an overhaul of the state standards based on a democratic, grassroots process involving teachers, students, and parents to determine what our communities want students to learn. Support the opt-out movement and oppose high stakes testing which disproportionately harms special ed and ESL students. Initiate a shift to alternative and teacher-generated portfolio/project-based assessments. Educate parents about their rights to oppose testing. End test-based, snapshot evaluations, and outside evaluators. End mayoral (and gubernatorial) control of the schools. Make the UFT a Democratic,Transparent and Accountable Member Driven Union. Subject all UFT positions to election and recall, including DRs, and put union officers and staff on the member’s pay scale. Open negotiations. Let the members know what is on the table. Create a sliding scale for union dues based on salary and require dues increases to be voted on at the Delegate’s Assembly. This needs to be included in your platform: For every child in a class above class size limits, the teacher is accorded extra pay. You would see how fast class sizes would come down. Teachers shall have the power to remove chronically disruptive pupils from their classrooms. Students who are disruptive shall have their parents fined. If the parent works, the parent shall be fined from their salary. Welfare recipients shall see their payments cut off. You’d see how fast both groups would conform. Leadership Academy Principals must teach each year, and NOT the top classes either. They need to get a feel of what is going on. Ms. Weingarten is to be denounced for taking her job time to go around campaigning politically. This has to stop. The chancellor’s position shall be abolished and replaced by a committee of active and retired teachers and administrators. Parents shall have representatives on the committee. This is what your platform should look like and not merely be a laundry list of liberal dreams. Ed you are wrong on this. If they could get teachers to take more money for children they would do it in a heartbeat. You might rich but you’d ahve class sizes with 50. Just get rid of more teachers. Nice message to parents – we are fine with high class sizes as long as we get paid. What next? Sell off the lunch hour? Your proposal is actually a weakening of bargaining rights and falls in line with general refusal to put class size on the table in collective bargaining.